Our longer break packages allow you to really explore the Aosta Valley, on and off the trails. Get more miles under your bike with our longer packages, explore more of our two resorts. You can be taken to La Thuile by an Alpine Revolution staff member, completly free of charge. Take a day off the bike to go and explore what The Aosta Valley has to offer, with attractions such as the historic castles or the Skyway Monte Bianco! Take a look at a sample itinerary we've set up, this is just a guide to show you what you could get up to when you're out in the Aosta Valley. The days are also jusat a guide. Arrive in Turin/Malpensa and transfer to resort. Welcome meeting in hotel and opportunity to build bikes in our secure storage building. Your first ride out with Alpine Revolution in Pila. A day away in the safe hands of one the local guides offering some of the best back country in The Aosta Valley. A days riding in La Thuile. Another day away in the safe hands of the local guides! They'll show you even more back country riding to suit your taste! A days riding in Pila. It's easy to travel with Alpine Revolution! Our longer breaks are all about you! You tell us when you want to go, where you want to stay and we will do the rest! Let us know which hotel you like, if there's more than one, please let us know and our experts will give you some more information on them. When would you like to travel? Just let us know by filling in our form in the hotel section you like. You can travel on any day you like, it's completely up to you. We offer a few optional extras, such as return transfers which start from only £50pp from Turin. Guiding is also available, with our team out in Aosta Valley, you'll be able to go on trails and routes which suite you ability. Don't want to take your own bike? Bike hire is as little as €50 per day. There are lots of option for you to get to the Aosta Valley. Lots of people self drive to the Aosta Valley, to turn it into a real experience (plus there is an array of beautiful scenic routes on the way through the French and Italian Alps). 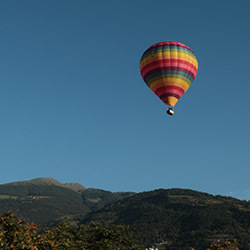 Air travel is also available, you can fly into Turin or Milan, we off return Transfers too! 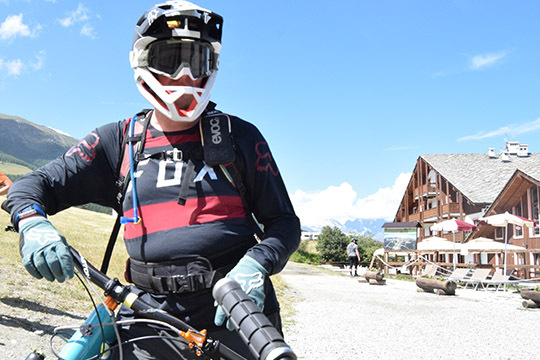 "The longer breaks were perfect for me and my partner, we really got to explore the Aosta Valley, it gave us chance to ride as much as we wanted to but still have time to adventure around the town of Aosta. "What a fantastic week! The group I was with Enjoyed it so much we are coming back next year! We absolutely loved Geoff, our guide who showed us around every. "I've never been to a place like this, the Aosta Valley is amazing. I opted to stay for 6 days which was great because I got the time to go down the trails I wanted without missing any of the good ones. We have a great range of accommodation to choose from. From traditional family run hotels to the ultra modern. All rooms have private facilities and are within walking distance of our office and storage facility.